I'm very grateful to Christa from Stories of a House blog for the inspiration for this dresser. 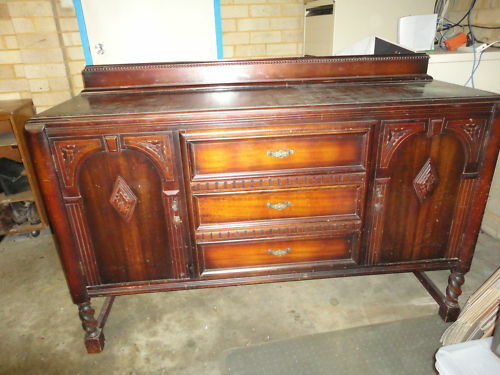 I bought this sideboard from a lovely woman who was selling her house and a lot of belongings because of a divorce. She was still very sad but I could feel her strength of character and I'm sure she'll find peace and happiness soon. Colours are British Paints' Blue Cashmere and Porters Paint's White. The wooden top surface has been stained walnut then waxed. The painted surfaces have also been waxed for protection. Original hardware. For sale in my shop. Let me know if you are interested. what a gorgeous color combo, fiona! i love that shade of blue- beautiful! and what a great unique piece! Love it! I really like the colors you used together...great transformation, tomorrow I have a link party and would love for you to join! Are you kidding me? That is gorgeous! Love the two tone colors- just beautiful! Hi, friend! I'm admiring all your creative posts here so can you please share them with us at the Creative Bloggers' Party & Hop? The link is at http://www.homemakeronadime.com/2011/04/creative-bloggers-party-hop-042411.html. that is gorgeous! love it. i smell a feature! thanks for sharing this at my party!!! Beautiful Piece! Fantastic Paint job! Way to go! oh my lord, that dresser is insane! in the best way possible. that looks flipping amazing with those colors.